The Finke Gorge National Park popular for its red cabbage palm stretches over 46000 hectares. The sumptuous valley is rich with a diverse range of unique and rare plants that grow in this area. In the park you can enjoy the views of the ancient palms and the Aboriginal cultural sites. The beautiful Finke River which is considered as the oldest catchments in the world takes its course through the valley significantly making its view more commendable. The best time to visit the valley is between April to September. Camping is permitted only in designated camping areas. You cannot use wood from the park to make firewood. Trash bins are not provided in the park. You would have to take your waste and dump it outside the park premises. When in the park, drink a lot of water to stay hydrated. You could you a taxi or car to get to the park. 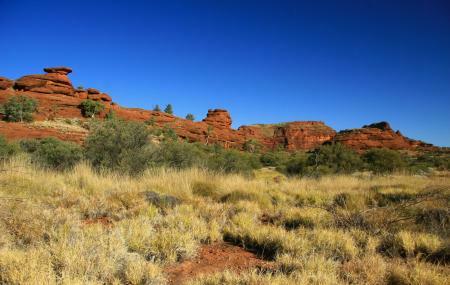 How popular is Finke Gorge National Park? People normally also visit West Macdonnell National Park while planning their trip to Finke Gorge National Park. WOW.......... just WOW.... 4WD only AMAZING views... heaps of 4wd action .. amazing place, rich in natural and cultural heritage, stunning landscapes, and arid zone fauna and flora. What an amazing drive! Did it south to north (Uluru to AS) Don't take a trailer! And carry a UHF on channel 10 people it's a National Park. Use your radio as there are a lot of blind turns, river exits etc. We came across 4 vehicles, none on channel 10. This track has everything except mud but if you really want it it's there too. Hundreds of metres of river sand at times. Bulldust patches, gravel, rocks, red dirt. In the middle is Boggy Hole. Clean water with a green tinge. There are fish in there too. Lots of shade to camp in. A great day activity and kudos to Territory 4x4 for marking the trail.